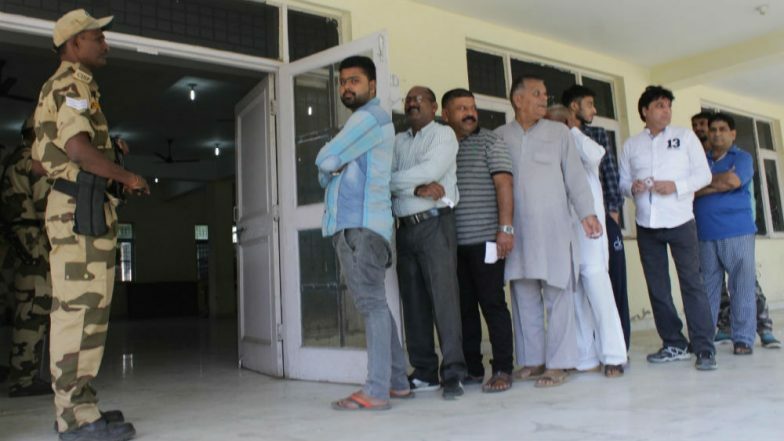 Lucknow, April 11: Voting for the first phase of Lok Sabha Elections 2019 in eight constituencies of Uttar Pradesh concluded on Thursday, April 11, at around 6 pm. Earlier, polling began for the Saharanpur, Kairana, Muzaffarnagar, Bijnor, Meerut, Baghpat, Ghaziabad, and Gautam Buddh Nagar seats at 7 am. The average voter turnout from the eight Lok Sabha seats in Uttar Pradesh after the end of polling was 64 percent. Uttar Pradesh Lok Sabha Elections 2019 Schedule: Constituency Wise Dates Of Voting And Results For UP General Elections. There was tight security in all the eight constituencies that went to polls today. However, CRPF had to fire shots in air when some people tried to vote without proper ID proof in Shamli, reported news agency ANI. In the first phase, as many as 1,50,65,682 voters-- 82,24,835 males, 68,39,833 females and 1,014 third genders will exercise their franchise. SC Mishra of Bahujan Samaj Party (BSP) said that, "We've registered another complaint with Election Commission & have sent them a video clip of EVM, in which it is seen that 'elephant' symbol is being pressed but vote is going to BJP's 'lotus' symbol. Our people had complained against it but no action was taken." In the initial few hours, there were reports of an EVM malfunction in Ghaziabad in Uttar Pradesh. In Baghpat, flower petals were being showered and 'Dhol' was being played to welcome voters at polling booth number 126 in Baraut. Voting is being held across 16,518 polling booths set up inside 6,716 polling centres spread across these eight constituencies. Voting is taking place through Electronic Voting Machines and VVPAT machines have also been placed at every polling booth. Here’s how you can check your vote on VVPAT. Who Will Win Uttar Pradesh Lok Sabha Elections 2019? Here's What Opinion Poll Predicts; Watch Video. A total of 96 candidates are in the fray in these eight constituencies. From Saharanpur, Congress has declared Imran Masood as its candidate. The Bharatiya Janata Party (BJP) has given ticket to Raghav Lakhan Pal, the sitting MP from the seat. The candidate for the Mahagathbandhan (the alliance between Samajwadi Party and Bahujan Samaj Party) is Haji Fazlurrehman. From Kairana, Congress has declared Harendra Singh Malik as its candidate. The Bharatiya Janata Party (BJP) has given ticket to Pardeep Kumar. The candidate for the Mahagathbandhan (the alliance between Samajwadi Party and Bahujan Samaj Party) is Tabassum Begum. From Muzaffarnagar, Congress has declared Narendra Kumar as its candidate from the seat. The Bharatiya Janata Party (BJP) has given ticket to Sanjeev Kumar Balyan, the sitting MP from the seat while Ajit Singh, the Rashtriya Lok Dal (RLD) chief has also declared that he would be fighting from the constituency. From Bijnor, Congress has declared Nasimuddin Siddiqui as its candidate. The Bharatiya Janata Party (BJP) has given ticket to Raja Bhartendra Singh, the sitting MP from the seat. The candidate for the Mahagathbandhan (the alliance between Samajwadi Party and Bahujan Samaj Party) is Malook Nagar. From Meerut, Congress has declared Harendra Agarwal as its candidate. The Bharatiya Janata Party (BJP) has given ticket to Rajendra Agrawal, the sitting MP from the seat. The candidate for the Mahagathbandhan (the alliance between Samajwadi Party and Bahujan Samaj Party) is Haji Mohammed Yaqoob of BSP. From Baghpat, the Rashtriya Lok Dal (RLD) has declared Jayant Chaudhary as the candidate. The Bharatiya Janata Party (BJP) has given ticket to Satya Pal Singh, the sitting MP from the seat. The Mahagathbandhan - grand alliance between Samajwadi Party and Bahujan Samaj Party) is Haji Mohammed Yaqoob of BSP. From Ghaziabad, Congress has given ticket to Dolly Sharma, the Samajwadi Party to Suresh Bansal and the Bharatiya Janata Party (BJP) has showed faith in the sitting MP from the seat, General VK Singh, by giving him ticket again. From Gautam Buddh Nagar, Congress has given ticket to Arvind Kumar Singh, the Bahujan Samaj Party to Satveer and the Bharatiya Janata Party (BJP) has showed faith in the sitting MP from the seat, Mahesh Sharma, by giving him ticket again. Voting for the Lok Sabha Elections 2019 will take place in seven phases. While the first phase of voting is being held today, the last phase of voting will take place on May 19. In Uttar Pradesh, voting will take place in all the seven phases. The counting of votes will take place on May 23. Stay tuned to LatestLY for all the latest updates of Lok Sabha Elections 2019.